Born on January 25, 1828, in London, Charles Allston Collins was writer, painter and an illustrator as well in the British countryside. The real-life experiences of Charles have had a long effect on him which was reflected in his paintings as well. Charles was the younger child of his parents, William John Thomas Collins and his mother, Harriet Geddes. He has mainly inherited his talent from his father, who was also a painter. His brother was born in 1824 and he took birth in Hampstead, north of London. 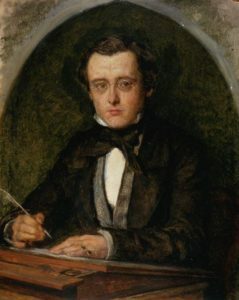 His elder brother, Wilkie Collins was a novelist was educated at Stonyhurst College in Lancashire. 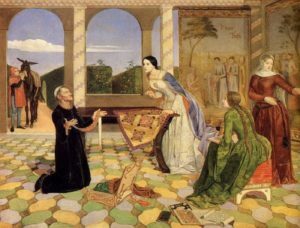 Charles joined the Royal Academy Schools at the age of nineteen and got well associated with Pre-Raphaelite Brotherhood based on which he later painted the Berengaria’s Alarm. He had good and long-lasting ties with William Holman Hunt and John Everett Millais. It is said that Charles once had an episode of almost drowning in water and as a result of it, he grew a nervous man all through life and had a phobia of water. Charles once shared with his friend Collins that whenever he was completing a painting, he felt acute uneasiness and pain in his stomach. Collins replied to comfort his troubled friend by saying that it was his modest nature and desire to excel his work which never satisfied him. During his early years as a painter, he fell in love with a woman named Maria Rosie but eventually got rejected. This made him aesthetic and introspective. The Berengaria’s Alarm painting by Charles portrayed the wife of King Richard, the Lionheart who was searching for her partner’s girdle. The characteristic features of Pre-Raphaelitism were pattern making details, works based on embroidery and flattened modelling as well. Charles work focused on details and seeing this he was offered to be a member of the brotherhood but opposition from a few kept this from Charles. 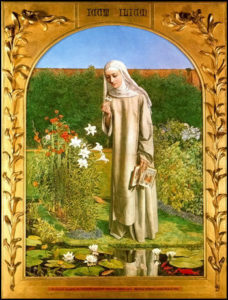 The best works of Charles included Convent Thoughts, which majorly depicted his attitudes that he had accumulated over the course of his experiences in life. Other famous paintings of Charles were May in the Regent’s Park and Good Harvest of 1854 completed in the year 1852 and 1855 respectively. The painting of Georgina Hogarth as Lady Grace of 1855 was also well known among his quality works. It has been asserted by John Everett Millais that he regularly left his works of art half-wrapped up. William Holman Hunt noticed that Charles could have held the field for us had he done himself equity in plan and had the bravery to keep his motivation. He consistently felt lost hearted when any artwork was almost on its way toward consummation, forsaking it for another subject, and this instability he revelled until he had at least twelve incomplete canvases never to be finished. In the late 1850s, Charles abandoned his career as a painter and was motivated to start afresh as a writer, inspired by his own brother. Charles was introduced with Charles Dickens by his friend Wilkie. Charles Dickens gave Collins the opportunity to provide his articles for the Household Worlds. Collins attempted at several writing styles and genres while he was active as a writer. His first book named The New Sentimental Journey was based upon his tourism stories of Parisian tourism mainly. He had been there for quite some time and this was mentioned in Dickens’ journal, All the Year Round. In 1860 he wrote and published another book, The Eye-Witness: And His Evidence about Many Wonderful Things. Collins wrote three novels in his writing career. They are Strathcairn in 1864, The Bar Sinister: A Tale in 1864 and At the Bar: A Tale in 1866. Charles fell in love with Dickens’ daughter, Kate and expressed the same to him as well, and at first, her father denied permission. The main reason for this denial was the living condition of Charles with his friend Wilkie in the company of a girl with an illegitimate child. Later after several attempts of Kate to convince her father and upbringing of their family past where Dickens’ himself left Kate’s mother for his new love, the permission for the marriage was granted. They both got married on 17th July in 1860 and later moved to Paris. Despite the efforts made, the marriage turned out to be a failure. His own wife admitted that Charles was impotent. They had no children either and Charles was majorly occupied with his illness for a larger portion of his married life. In his last few months, he was occupied with Dickens’ incomplete novel, The Mystery of Edwin Drood but was able to complete only the cover. He died of cancer in 1873 and now rests in London at the Brompton Cemetery.